Fairfield resident and USA Today bestselling author Christi Caldwell poses with her new book, “The Hellion,” in her Fairfield home. WESTPORT — Christi Caldwell breaks her career up into two periods. The time before her son Rory was born and the time after. The point of inflection was 2008. At the time, Caldwell taught history at Fairfield Warde High School, but when Rory was born and Caldwell and her husband learned he had down syndrome, Caldwell did not return to Warde in order to attend to Rory’s many medical appointments. “It was a really uncertain time in my life and so I found that writing was really cathartic. I put a lot of emotion into it and it’s where I channeled my energy,” Caldwell, 38, said. When Caldwell was ready to return to work, she couldn’t find a teaching job. Facing financial hardship, Caldwell and her husband, a middle-school science teacher, moved to North Carolina, but couldn’t find work so returned to their native Connecticut a year later. The years after Rory was born were undeniably difficult for Caldwell and her family. “We ate our Halloween pumpkin one year because we didn’t have money for produce,” Caldwell said, adding the city of Milford helped her family out with oil because they couldn’t afford it and also provided her son with Christmas gifts because she and her husband didn’t have the funds. Caldwell began writing long-before Rory was born but said her work took on a new intensity after his birth. “I started to reassess my view of perfections and imperfections and what makes something perfect. I looked at us all as kind of flawed beings and that’s what makes the world really beautiful and unique and so I started writing about really flawed characters,” Caldwell said. Ever since she was 13, Caldwell read historical romance novels. “What I loved is that it is a blend of history and they always end with a happily ever after because I feel life is hard enough,” Caldwell said. While earning an integrated bachelor’s and master's degree in history education from the University of Connecticut, Caldwell tried her hand at writing historical romance and continued writing into her teaching career at night after grading papers. After Rory’s birth, Caldwell’s wrote at night and on the weekends when her husband would take Rory out of the house. Despite all the time Caldwell put into her writing — she wrote two books in total after Rory’s birth — she sat on the works and thought they’d never see the light of day. Eventually, Caldwell and her husband both found teaching jobs again — her at Stamford High School and her husband at Stamford’s Cloonan Middle School. In 2013, however, Caldwell’s world was once again turned upside down. She was pregnant with twin girls, and the pregnancy was difficult and complicated. For weeks, Caldwell was on bed rest with her twins and continued to write. Out of boredom, she watched episodes of “Say Yes to the Dress”, including one which featured historical romance author Valerie Bowman. Cadwell saw Bowman’s life and decided to self-publish some of her work through IndyPublish.com, not thinking anyone would find them. In the past, Caldwell had sought out different agents and editors at historical romance fiction fests but was told over and over again that her work wouldn’t sell because it was depressing and dark and people read historical romance because they don’t want to think. Nonetheless, the novella Caldwell self-published garnered a following, and quickly. Caldwell could see on IndyPubish that people read and reviewed her book and were asking for more, so Caldwell published her first full-length novel, “Forever Betrothed, Never the Bride”, which was the first book she wrote after Rory’s birth and which became a USA Today Bestseller. “I literally found a readership overnight,” Caldwell said, adding, “people were asking for more and saying, where are your books?” While her newborn twins slept, Caldwell wrote. “I was doing it because I love it. It’s never work,” Caldwell said. 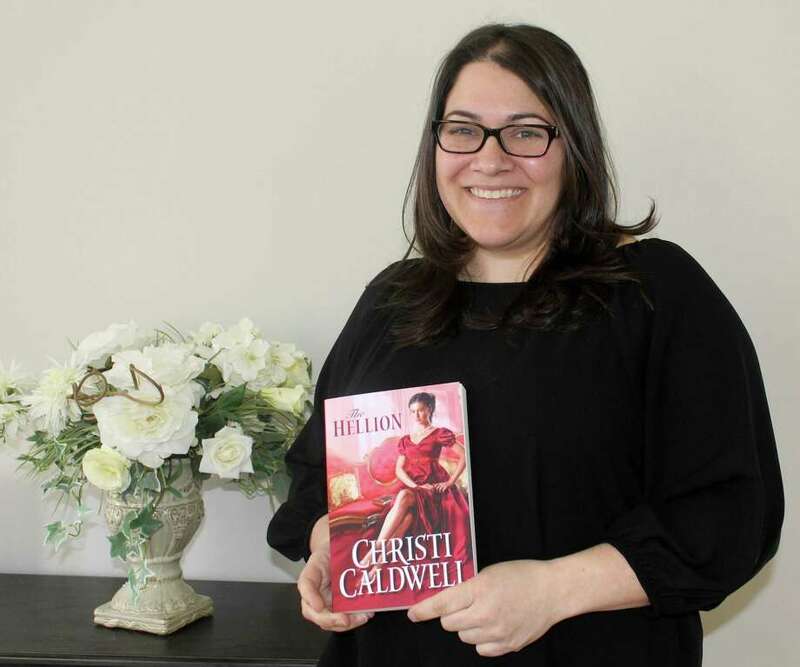 A prolific writer, Caldwell has published nearly 40 books of historical romance in the last five years and is now a full-time romance writer. This month, she and her family moved to Fairfield because she felt it was a community that could embrace Rory and his challenges with down-syndrome. “I always said if I could live in Fairfield I would live in Fairfield,” Caldwell said. All of Caldwell’s historical romance books are set in the Regency period in England, which spanned from 1805 to 1822 and is the most common setting for historical romance novels set today. “People love the pageantry and the curtsies and the manners and the proper way that people behaved. It wasn’t overt sexuality. The kiss of the fingertips is just as romantic, if not more, than what you see in other romance novels more about how it is today,” Caldwell said. While Caldwell said readers enjoy the chivalry of the period, it turns out they don’t mind that her characters have struggled, and push the boundaries of their time. “What people tend to like is the characters who break outside the mod. It’s not necessarily about the hero who’s polite and proper. It’s the one who stands and maybe makes waves in society for different reasons. Or people enjoy the heroine who is strong, ‘blue stockings’ they're called, and doesn’t allow herself to be constrained,” Caldwell said.